An online computer science associate degree sets you on the path to a lucrative and fast-growing field. The job growth rate among computer science-related careers is expected to increase by 12% in upcoming years, and as computer science skills are currently in high demand nationwide, your chances of finding a job locally are high. With your associate in computer science, you can pursue work as a programmer, technician, help desk worker, security specialist, ethical hacker, or administrator of network, system, database, or data centers, among other roles. In an online computer science associate degree program, you’ll have the opportunity to learn programming languages and business skills that are highly sought-after by employers. By learning through online classes, you will also gain the skills you need to work remotely, as many IT professionals do. Online classes allow you to study on your own schedule and pace, making them ideal for those who work full time. Once you earn an online associate degree in computer science, you can advance your career further by seamlessly transferring your credits to earn a bachelor’s degree. Your credits will transfer regardless of whether you choose to continue your studies online, or take classes on campus. Ultimately, if you’re interested in computer science, an associate degree is the first step towards a rewarding career in the field. 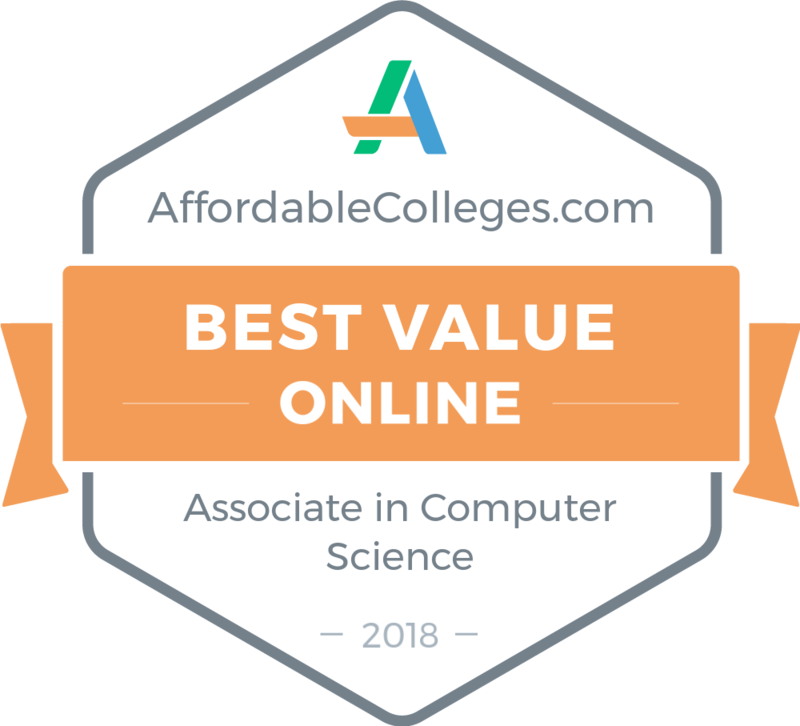 Read on to explore our ranking of the most affordable online computer science associate degree programs out there. Students enrolled in WNCC's associate of science in computer science program learn the foundations of programming, programming languages, algorithmic design, and operating systems. Learners access course materials and collaborate online via Blackboard Collaborate, and students are taught by faculty who are experts in their field and trained in the latest emerging computer information technologies. Students who choose to pursue a hybrid degree, taking some courses in-person and others online, may be eligible for a NASA fellowship, which offers exclusive opportunities to work with drones, remote control aircraft, and robotics. This online computer science associate degree provides students with a two-year foundation for a bachelor's degree in computer engineering, computer science, programming, or a similar field. WNCC students enjoy free access to practice and certification exams for several industry-standard certifications, including Security+, CompTIA A+, and Microsoft Office Specialist. Online program admission requirements include copies of official high school or GED diploma and completion of the college entrance test eCompass. Students interested in transferring credit to or from WNCC can leverage the statewide transfer evaluation system, which guides students through an on online credit evaluation process. Hazard Community and Technical College's associate degree in computer and information technologies offers tracks that build expertise in network administration, information security, application, programming, or network technologies. The associate in applied science in computer and information technologies with a computer science track provides a general education foundation and features classes covering topics like writing and calculus, paired with technical major courses. The program is designed to set students up for future academic success and lead to a mastery of computer science basics. HCTC trains students in advanced programming and learners take courses in proof techniques, computational complexity, advanced data structures, and other in-depth topics. The school may accept transfer credits that students have earned within the past five years prior to enrollment. Students must earn a grade of "C" or better in all courses in order to graduate from HCTC's associate degree in computer science online program. Delivered via the shared statewide Kentucky Community and Technical College System Online portal, HCTC is one of several Kentucky-based colleges that offer this online degree. Out-of-state online students receive the same affordable tuition rates for HCTC's online computer science associate degree as their on-campus counterparts. NICC's associate of science in computer science offers a choice of three degree concentrations, including programming, networking, or web development and programming. Full-time students begin the program in the fall, while part-time students can start during any term. In addition to computer science courses, NICC requires students to complete a foundation of academic courses in topics including language, science, and mathematics, which prepares students for continuing studies in a four-year bachelor's degree program. Core coursework combines hands-on projects with meaningful lectures that equip students with the knowledge and skills they need to master computer programming basics and major-related topics, allowing graduates to enter directly into the workforce if they choose. The school reduces tuition costs for each semester that a student remains enrolled in the program. Per-semester tuition rates are competitive and provide discounts for Iowa residents. All graduates of NICC's online associate degree in computer science program are eligible for lifetime placement assistance through the NICC Placement Office. Graduates of South Texas College are well-prepared to transfer their online associate degree in computer science to either the continuing bachelor's program at STC or to another four-year college or university. Students who plan to transfer outside the university should consult with a computer science program adviser to determine the best sequence of courses. In addition, graduates with an associate of science in computer science from STC are ready for entry-level jobs in the computer science field. The 62-credit curriculum features a combined focus of general education and computer programming coursework. Students access online courses via the Blackboard LMS, which offers around-the-clock live chat support. Students seeking financial aid may be eligible for one of STC's several merit-based, need-based, or departmental scholarships. To help learners budget their tuition payments, STC offers monthly installment payment plans during the fall and spring semesters. Distance learners have access to online tutoring and on-demand academic success workshops. Hawaii Pacific University's associate of science in computer science is available to students enrolled through the college's military campus program and who have completed a minimum of 60 hours of core and elective courses. Through coursework in computer science, data structures, and discrete mathematics for computer science, students learn topics such as how to develop problem-solving algorithms, master programming basics, and apply data structures and other methodologies when creating software. As part of the computer science core, students choose one of three interdisciplinary courses, including data analysis and visualization. HPU offers a flexible enrollment policy, allowing students to officially opt out for one or two semesters if necessary and re-enroll at a later date. HPU accepts up to 36 semesters credit hours earned through credit by examination, such as CLEP, toward the school's online computer science associate degree. Transfer credits must be relevant to program requirements and students must have earned a minimum grade of "C" in all applicable credits. Graduates of Rogers State University's associate in science in computer science are prepared for entry-level jobs in the computer science field or continuation in RSU's or a four-year baccalaureate program in computer science, information technology, or information systems. Students master the basic concepts of computer programming and leave the program with a deeper understanding of technology applied to the 21st century workplace. The curriculum requires a minimum of 65 credits in general education, electives, and major courses like introduction to networking and programming. RSU's distance learning programs are a shared program through the Southern Regional Education Board electronic campus and available to students residing in National Council for State Authorization Reciprocity Agreements member states. RSU offers a cheap associate degree in computer science online program that includes reduced tuition rates for Oklahoma residents. Distance learners benefit from access to many of the same resources as students on campus, including the campus bookstore, digital library resources and tutorials, and advisory services. Incoming freshman applicants submit official high school transcripts and ACT scores with their online application. Designed as a transfer program for entry into a four-year bachelor's degree, graduates of the online computer science associate degree hold a solid introduction to theoretical and practical concepts in computer science algorithms, data structures, and programming. TCCC's associate of computer science offers a curriculum that the school designed around recommendations from the Association of Computing Machinery, the longest-running professional and academic organization of its kind. Students choose either a computer science general or engineering track and TCCC students have transferred their associate degrees to four-year programs at renowned four-year institutions like Cornell University, Rochester Institute of Technology, and SUNY College. TCCC performs a credit transfer evaluation for courses in which students have earned at least a "C", and considers applicability toward program requirements on an individual basis. Students must earn at least a 2.0 GPA through Tompkins in order to earn their degree. Bristol Community College's associate in science in computer information systems transfer progam features a computer science transfer concentration and prepares students for transfer to a four-year computer science program. Students are especially equipped for transfer into University of Massachusetts at Dartmouth's program, with whom Bristol worked closely to develop its computer science curriculum. The school may require students admitted to BCU's online computer science associate degree program to invest in hardware, software, or operating systems prior to or during study. The program includes general coursework aligned with the computer science field, including topics like technical writing, calculus, and discrete structures. Students also take a natural or physical science, a history course, and an elective in the humanities. Interesting major courses include software specification and design and object-oriented Java programming. BCC delivers online courses via the eLearning platform, which also provides access to tutoring, disability services, and a technical help desk services. The school's flexible enrollment policy allows students to enroll full- or part-time and complete all requirements at their own pace. Students enrolled in Franklin University's computer science associate of science degree complete 64 semester hours of general education, electives, and major area courses. Before beginning major degree coursework, admitted students must complete coursework in college writing, basic learning strategies, and speech or interpersonal communication. Students must also meet Franklin University's basic algebra requirement. The school's computer science program emphasizes software development, providing students with opportunities to evaluate and create software-based solutions and enter careers as software or systems developers. Real-world based courses are created and taught by faculty who are active experts in the industry. Franklin offers a variety of scholarship opportunities, including awards for leadership and community service, STEM-based programs, and merit-based scholarships. In order to qualify for admission, applicants must provide either a high school/GED diploma or at least 24 transferable credit hours from an accredited institution. Franklin also accepts college credit for military experience and training, and the university's online computer science program is an ideal option for active military members. Both part- and full-time students can begin the program during the winter, spring, or fall semesters. Jamestown Community College's associate of science in computer science is designed for students who wish to transfer to a bachelor's degree program at a four-year college or university. Computer science students learn the basics of troubleshooting hardware and software problems, designing a basic LAN, writing computer programs, and applying object-oriented programming to write and debug software programs. The curriculum includes 60 credits of both general education and major courses in topics like microcomputer hardware/systems software and data structures. A solid footing in mathematics is an essential foundation for success in computer science, and students who do not meet the school's placement requirements for college-level mathematics courses will likely take more than two years to complete all degree requirements. This affordable online computer science associate degree features affordable per-credit rates for full- and part-time students, with further discounts for New York state residents. A member of NC-SARA, JCU's associate degrees are recognized in other member states. JCU accepts up to 30 qualifying credit hours from a four- or two-year college toward associate degrees. The associate of applied science in computer science from Trinity Valley Community College is specifically designed to meet the economic needs of the surrounding Texas area, from Athens to Terrell. The program curriculum and evaluation is designed with input from a local advisory committee made up of businesses and individuals. Students are prepared for entry-level computer science positions or transfer to a four-year higher education institution. The program's two areas of emphasis include computer and information systems or computer programming. Trinity Valley is recognized as an open-enrollment institution and accepts most students who complete the admissions process. In addition to an applications, students complete Texas state's placement testing for math and English classes and a new student orientation before registering for classes. Trinity Valley's annual tuition for its online computer science associate degree is affordable for both in- and out-of-state students. The program features a full set of services for distance learners includes career counseling, disability services, and academic advisement. Georgia Military College's online campus currently serves more than 1,000 online students, and the college's total student body is composed of a 57% minority population. Students enrolled in the school's associate of science in computer science program approach basic programming and web design skills, learn object-oriented program design in Java and Python languages, and develop a deep understanding of standard data structures. The program prepares graduates to enter the computer science field in entry-level positions or to transfer their associate degree to a four-year BA or BS program. GMC offers all online students the same competitive tuition rate for the school's associate degree in computer science online program. Students who need to improve their academic skills and knowledge in subjects such as English, reading, or mathematics before enrolling in college-level courses may obtain conditional admission status while they complete learning support courses through Board of Regents schools. A streamlined application process includes an official high school transcript or copy of a GED diploma. All students benefits from free tutoring, small class sizes, and the opportunity to qualify for one of several available scholarship programs. Students enrolled in Palomar College's associate in computer science program learn how to design hardware and software solutions, including algorithms, programming languages, and software applications. The 26-unit curriculum combines major requirements and electives with courses covering, for example, programming languages, computer architecture, data structures, and object-oriented programming. The program's innovative elective course options include Android development, video game programming, and iOS development. Depending on the courses they choose, students access materials, assignments, and interact with peers and their instructor via the Blackboard or Canvas platforms. Distance learners benefit from access to Palomar College's free online tutoring, counseling services, virtual library resources, and a host of other student resources and services offered via the California Community Colleges Online Education initiative. The school offers students who graduate from an eligible high school in the Palomar College service area and join the First Year Experience program one year of free tuition and other academic resources. In addition, students entering from the greater San Marcos school district are eligible for enrollment in the Palomar Promise+ program, which includes up to two years of scholarship funds while earning an associate degree (plus two additional years of support with transfer to California State University). Central Texas College's associate of applied science in computer science provides a choice of four tracks: information security, information technology, network systems administrator, or programmer analyst. While the career focus of each degree program is different, all require students to complete 60 credit hours and include similar first-year courses in academic and computing basics (such as algebra and integrated software applications). All degree programs also require a four-credit internship in a related field. Students access asynchronous online courses via the Blackboard platform, and all learners benefit from access to web advisement services. CTC enjoys a long-standing reputation as a military-friendly university, having provided flexible degree programs for military students around the world for almost 50 years. For students looking to eventually transfer their associate degree, CTC maintains several articulation agreements with area schools and transfer planning tools. Students who apply for financial aid may qualify for one of 170 CTC merit- and need-based scholarships. Students enrolled in Park University's associate of science in information and computer science program choose from four concentration paths: software engineering, networking, computer science, or data management. Regardless of their choice of area of expertise, the school offers students opportunities to apply problem-solving and critical-thinking skills in creating computer solutions and learn how to communicate and work effectively in a team environment. Students who major in software engineering learn to design innovative software programs with data structure tools, learners in networking master concepts in computer networking and security technologies, and students majoring in data management hone their abilities to design smart data solutions. The 30-credit curriculum includes 24 credits of CS prerequisite courses, including introduction to programming and managing information systems. Park University's online courses are certified by Quality Matters' global standards. Courses follow an accelerated, eight-week format, with term start dates offered five times during the year. Classes are small and feature students from over 120 countries. The school offers active duty military, veterans, and federal government employees and their dependents generous per-credit tuition discounts. Northern Essex Community College's associate in science in computer and information sciences program with an emphasis in information technology provides students with an excellent introduction to the basics of IT and computer science. Coursework includes topics like hardware and applications software, information security, interactive media programming, and computer networks. Delivered via the Blackboard platform, CS-specific courses include web development, networks, and integrated computer applications. Enrolled learners gain a thorough understanding of how each technology component and application relates to and depends on the other within the context of organizations and society. This online computer science associate degree program equips students with the skills needed to begin entry-level positions or transfer into a four-year computer science program. All students with a high school diploma or GED benefit from Northern Essex's open admissions policy, which grants enrollment to students who meet this requirement and attend an orientation session. Northern Essex offers prior learning credit through qualifying examinations, portfolio evaluation, and military and other life experiences and training. Part of Lone Star College's 2+2 initiative (designed to help Texas students save money while earning their degree), LSC's two-year associate of science in computer science meets foundational requirements for completing a bachelor's degree program through a public Texas college or university. LSC offers open admission, with most students accepted after submitting an application and submitting proof of high school completion. All programs are accredited by the Commission on Colleges of the Southern Association of Colleges and Schools. The two-year, 60-credit curriculum blends general education courses -- such as history, calculus, and composition -- with computer science courses like programming fundamentals and computer organization. Students access online courses via the Dream2Learn (d2L) LMS. LSC offers an affordable online computer science associate degree tuition, with discounts for Texas residents. Computer science associate degree candidates are eligible to apply for one of several T-STEM or Workforce Solutions scholarships. Distance learners benefit from access to transfer or career planning services, depending on their planned path following graduation. If planning to transfer into a bachelor's degree program, Bucks County Community College encourages students to work early with an adviser from their desired four-year institution to ensure a seamless transition. BCCC's associate of science in computer science program emphasizes proficiency in algorithm development and evaluation, debugging, coding and testing, documentation, and holistic program analysis. In addition, the school offers graduates multiple opportunities to analyze a business problem and develop data management solutions. BCCC's recommended two-year course sequence includes 62 credit hours in both general education and major courses, and features courses like database design and application development alongside a computer science elective. Students access online courses via the Canvas platform and take advantage of an always-available library, online proctoring services, online tutoring, and other support services. BCCC accepts applications from recent high school graduates on a rolling basis and incoming students complete a series of placement tests. Central Methodist University's associate of science in computer science program provides students with the opportunity to build a foundation in programming languages, database technologies, and hardware and software applications. The program equips students with the skills and know-how to assess organizational systems, identify security issues or other technical obstacles, and develop effective solutions in response. Accessible via mobile devices, the MyCMU electronic portal offers 24/7 technical assistance from any location. Online computer science associate degree admission requirements include a high school education with a minimum 2.5 GPA, and qualifying ACT or SAT scores. Homeschooled students must provide a validated transcript, and transfer students must hold a 2.0 in all previous college coursework. The school offers all undergraduate students, regardless of state of residency, a discounted per-credit online tuition rate. CMU student resources include free NetTutor services, access to the library's digital databases, and a university email account. Weber State University's 63-credit associate of applied science in computer science includes a combination of support courses and computer science courses. Support courses are designed to provide fundamental knowledge and collaboration skills, such as physics for engineers and interpersonal and small group communication. Major courses cover IT-specific topics in programming, computational and data structures, software engineering and design, and computer architecture and organization. A streamlined application process for incoming freshmen requires that students submit official high school transcripts and, if applicable, official transcripts from any undergraduate programs attended. While not required, WSU uses ACT or SAT scores to help determine students' placement in math and English courses. WSU admits students with at least 30 or more qualifying semester hours as transfer students and makes decisions within three to five days after student submit all requirements. WSU's convenient and user-friendly eWeber portal includes access to the Canvas LMS, university testing and evaluation systems, and tuition payment dashboard. Ocean County College's associate in science in computer science offers a curriculum modeled after standards set by ACM and the Institute of Electrical and Electronics Engineers, Inc. Computer Society. OCC gears the program towards students who plan on transferring into a four-year college upon graduation. Once enrolled, students master the basics of computer programming, which serves as the foundation for learning about software development and constructing algorithms for problem solving. OCC's admissions requirements include a high school diploma with a minimum grade point average of "C" and a top 50% ranking within an applicant's graduating class. Required major courses include programming, data structures and analysis, and discrete mathematics. Students also have a choice of three credits of computer science electives in an area of personal interest and learners access all asynchronous courses via the Canvas platform. Distance learning services include Smarthinking tutoring, student support coaches, and financial aid counseling. OCC offers tuition payment plans to help students budget their finances throughout their program. Panola College's associate of science degree in computer science equips and prepares students to transfer to a bachelor's degree program at a four-year university or college. In addition to an online computer science associate degree, Panola offers multiple opportunities to obtain professional certifications in Adobe CS, CompTIA A+, as a Microsoft Development Technician, IC3 digital literacy, and several others. Students can access courses through the Canvas LMS on any digital device. Students typically spend at least three hours per week on each course. Exams must be proctored, and students can arrange to attend a location course at another institution close to their hometown. Online associate degree in computer science applicants must submit Texas Success Initiative (TSI) scores or proof of exemption and a high school transcript or GED diploma. Distance learners may leverage a variety of support resources, including an eLearning librarian, services for students with disabilities, and an eLearning support office. Lord Fairfax Community College's tailors its associate of science in computer science program for students who plan to transfer their degree to a four-year college or university and complete a bachelor's degree in systems development, engineering, computer science, or a related field. The program requires completion of 60 general education and major credits over two years. Computer science coursework includes topics in computer science, computer organization, and a choice of two STEM electives. LFCC encourages students to work with an adviser from their desired transfer institution early on to ensure a seamless transition. Virginia residents receive discounts on the school's per-credit tuition rates. LFCC offers three different payment plans for students who enroll in the starting fall semester. Students who are at least 18 years old and hold a high school education (or equivalent) are eligible to enroll in LFCC's associate degree programs. Academic and career resources for online students include online writing feedback, resumé and job placement assistance, and veterans services. Ivy Tech Community College's associate of science in computer science program prepares students for careers in emerging and evolving fields like computational theory and algorithmic solution development. The program focuses on providing students with opportunities to work with emerging technologies and gain the design and problem-solving skills necessary to developing effective software solutions. ITCC's develops its computer science curriculum with feedback from local, national, and global organizations and businesses who are members of the college's advisory board. Graduates can expect to be prepared for careers in a variety of fields, from research and development to business to the military. Students in need of financial support are only required to complete one application to be eligible for one of ITCC's 600 scholarships totaling $6 million in financial aid annually. ITCC provides an internship program in partnership with its School of Computing & Informatics, offering students opportunities like building and supporting the college's data hub to managing the college's website. Students enrolled in Iowa Western Community College's associate in arts computer science program choose from four degree concentrations: application programming, web programming, eCommerce, or computer networking. Students attend full- or part-time and complete IWCC's 64-semester-hour program at their own pace. Graduates prepare to transfer into a four-year bachelor's degree program or pursue entry-level to upper-level positions in IT. Each degree emphasis includes its own set of major requirements, built upon a foundation of supporting courses like public speaking and introduction to IT or computers. Though IWCC provides a recommended course sequence -- especially for those who plan to transfer to a four-year program -- students working toward their online computer science associate degree can complete most courses in any order that they choose. The school requires all potential students to provide official high school or college transcripts and complete placement testing prior to enrolling. IWCC offers over $2.2 million in scholarships each year to its relatively small student body of 3,000 students.